Today I took the grandkids to a fun event, the Back 2 School Party where the Abraham Lincoln Presidential Library teemed up with the community to collect back packs for low income students. The collection began on July 7th and has been a resounding success. This back to school party was the day the collection ended and the backpacks were turned over to Springfield School District 186. It is wonderful to say the least to see this museum and library giving back to the community in such a great way. 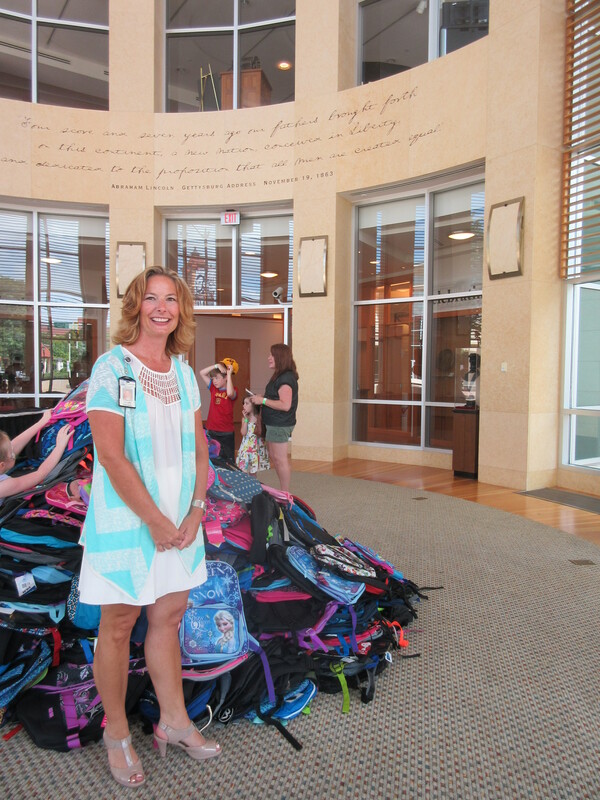 As of the last count the Abraham Lincoln Presidential Library and Museum (ALPLM) had 706 back packs that had been donated for students that might not otherwise be able to afford them. Those that donated a back pack received free admission to the museum. Besides the pile of back packs which were almost as tall as Thorpe, the library had a series of fun events for the kiddos to enjoy before heading back to the classroom. Activities included; cheer, tumbling, self-defense, ballet, crafts, book exchange, three different games, face painting, and of course dancing with glowstick necklaces! Both of the grandkids danced their hearts out until they discovered the cookies then dance time was over. My grandson was fascinated with Jay Curran’s self defense presentation. He learned a couple of cool moves that hopefully he won’t try out on his big sister! My grand daughter was busy with the crafts both of the kids created a craft and my grand daughter painstakingly picked out the perfect face paint design while patiently waiting in line.